The level of ignorance associated with disability in general and disability rights shocks me. I was shocked 35 years ago. I remain shocked today, 23 years after the ADA supposedly made me equal to other American citizens. This thought came to me early this morning when I was thinking about food. Going back and forth to Syracuse has forced me to be creative in terms of food. Regardless, I read with great amusement an article in the Houston Culture Map. Apparently there is a critically acclaimed restaurant in Houston--Oxheart. Like other restaurants known nationally, it is very hard to get a reservation at Oxheart. The restaurant has suddenly generated headlines for the wrong reasons. Apparently Oxheart is not wheelchair accessible. This fact was not made clear to one visitor who could not enter the restaurant and was allegedly forced to pay a $200 plus cancellation fee. Based on what I have read, I am not at all clear if the restaurant is or is not accessible. I do know the bathroom is not accessible--hardly a shock to others that use a wheelchair. retrofitting his tiny restaurant according to ADA standards would be cost-prohibitive. Besides, he said, incidents like the ones my friends and I experienced are rare. “Generally what we do is let them know what kind of accommodations we do have.” Those accommodations include a portable ramp (which wasn’t available on our Sunday evening visit, although both parties agree that the professor mentioned his handicapped status when his reservation was made.) A handicap-accessible restroom is not one of the accommodations. Yu had no suggestion as to what wheelchair-bound customers should do if they needed to use the facilities during one of Oxheart’s marathon tasting menu dinners. The owner/chef Justin Vu is ever so sorry. It was a "breakdown in communication". And how is it just because the "problem" arises rarely it is somehow okay? I must confess I found it sadly humorous that restaurant reviewers are so oblivious to wheelchair access. After 35 years of paralysis I have learned a few things. For instance, I do not gracefully accept an apology. I want to know one thing when the ADA is violated: how and exactly when will the so called problem be solved. I refuse to be bribed as well. No free hotel room or meals for this cripple. I do not complain for myself. Instead I want access for the next person that comes along. I have also learned I am screwed when a person starts to tell me all about how communication breakdowns are the the reason why a hotel room is not accessible or why a rental car with hand controls cannot be found. 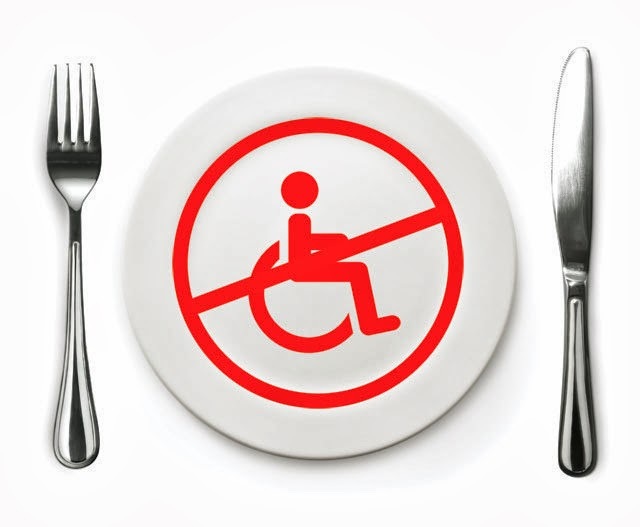 In the restaurant business, I have long observed the existence of the cripple table. This is invariably the worst table in the dining room. Out of sight, near a heating or air conditioning duct or in some way the least desirable place to eat. Space is also an issue: I wish I had a dime for every time a server bumped into my wheelchair. As for a bathroom, aside from big box chain restaurants this is a pipe dream. Even if a bathroom exists getting to it is an adventure--an adventure that involves many sorry's and having a multitude of diners awkwardly move or get out of their seats not once but twice. In the Journal of Voice physicians wrote about cutting the vocal cords of a 14 year boy with autism spectrum disorders and Tourettes Syndrome. See: http://www.ncbi.nlm.nih.gov/pubmed/?term=vocal%20surgery%20autism The boy apparently had nearly 200 vocalizations per day at approximately 90 dB. The physicians noted behavioral and antipsychotic medical interventions had all failed. The authors concluded: “this case demonstrates that laryngeal framework surgery may improve the quality of life in patients with severe and intractable phonic tics, with or without morbidity of autistic self-stimulatory behaviors... Long-term follow-up of this patient’s voice and behavioral development as well as his laryngeal growth is warranted”. As one would expect, people with Autism were not pleased. Indeed, most people with Autism were appalled by this surgical intervention. A quick google search of Autistic related blogs and comments on news articles clearly demonstrate outrage. I get this anger. When I read about what was done to the boy with autism I was instantly reminded of my visceral reaction to the Ashley Treatment in 2007. I was not alone as Ari Ne’eman, founder of ASAN was quoted in Salon that the: “The Autistic Self Advocacy Network views this surgery as profoundly unethical and bluntly are concerned that the UW Hospital approved it. Autistic people and others with communication related disabilities often use what’s termed as ‘problem behavior” as a way of communicating distress, anger, fear, anxiety or other important emotions that may not be easily communicated for someone without standard speech. There is a long history of family members and providers viewing these behaviors as strictly a medical phenomenon and not recognizing they’re important for communication. To violate a person’s bodily autonomy and damage their ability to communicate to serve the convenience of caregivers is nothing short of horrific. We view this as similar to the Ashley X Case or the long history of involuntary sterilization, teeth removal, and other inappropriate and unethical medical procedures conducted against people with developmental disabilities”. Kuusisto points out Caplan works within the medical model of disability and uses utilitarian logic. The “easy” solution, the convenient solution for care givers, is a surgical fix. Excluded from the discussion are people with autism in particular and more generally a disability studies or disability rights perspective. Caplan is the authority or seer the media seeks. He has mastered the sound bite and will comment on virtually any spectacle. The down side to this, and it is significant, is that virtually every news story I read referenced Caplan. It was widely reported the boy screamed non stop and was as loud as a lawn mower or motorcycle. Also reported was the fact that six months post surgery there is a 90% reduction in tic frequency and 50% reduction in intensity. The physician that performed the surgery is quoted as stating “the story is extremely easy to misunderstand”. The press clearly awards the physician great authority and points out that his own son was recently diagnosed with autism. Heavily implied, assumed really, is that Caplan and the physician that performed the surgery, are unbiased experts that know best. I think not. Of central importance is what is not known and the cultural penchant to avoid suffering at any cost--especially when disability enters the equation. Do I want people to suffer? Of course not. But exactly what is suffering? Was this boy and his family suffering? Pulling a page from the Ashley X handbook the physician states: “this is about a very particular problem with a particular solution. It has to do with human suffering and being creative about it. What would have been barbaric would have been to ignore it and say Sorry, see you later... It would have been unethical to let him suffer”. The boys perceived suffering was not ignored. All options had supposedly been tried. Behavioral strategies did not work. Medications did not work. Botox on the larynx did not work. It appears there were no options--or that is what we are led to believe. There is a real effort to soft pedal the extreme surgical intervention. The physician noted: “What we wanted to do was preserve as much native function as possible, maintain the natural progression of his voice box, and achieve the goal of reducing the frequency and loudness. This is a reversible operation. It’s something you can do and undo. You’re making someone a little more breathy and less powerful”. It is tempting, especially given the abuse of people with cognitive disabilities and mental illnesses by some in medicine over the much of the 20th century, to feel outrage at the idea of forcing surgery on an otherwise healthy young boy. But 21st century medicine gave Kade and his family a solution that has already allowed the boy to live a richer life -- and the solution can be reversed at any time. That seems to me to be cause for celebration, not condemnation. Unlike Caplan, I am not in a mood to celebrate. This surgical solution did not take place in a social vacuum. An article was published in a peer reviewed journal. It garnered a significant amount of press. The surgery was performed at the University of Wisconsin, a widely respected institution. The physician and parents have been quoted in various mainstream news outlets. I assume they have done interviews in person or on the phone. In my estimation there is an effort to mislead people. Again this harkens back to Ashley X’s parents. Six years after the court declared they illegally sterilized their daughter the parents remain anonymous and continue to give interviews in the press. So please spare me the rhetoric that this case is about one teenage boy with autism. This is a case of parental child conflict of interest. Like Ashley X, the parents sought a surgical solution to make the care for their child easier, less problematic. This line of reasoning is framed in a way to highlight the child’s difference and focus on his or her perceived suffering. Rather than assume competence the parents and physicians assumed incompetence. They did not think about what was possible. Instead they saw pathology. At no point does Caplan or a news story ask what did this teenager in think? Did he have any say? Was he, to the best of his ability, a part of the decision making process? Was a hospital ethics committee meeting convened to discuss the case? If so, what were the findings? Did the parents seek out suggestions from the autism community or other parents who had children with similar issues? Perhaps Caplan will address these issues. Better yet, perhaps he could refer the press to experts in the field of autism so a serious and sober discussion can take place. At a fundamental level the teenager in question is perceived to be different. He was deemed so different that he did not have the same civil rights as other typical teenagers. Some may perceive this as an extreme view. I think not. Would a parent of a typical child ever consider cutting the vocal cords of their child? Not a chance. This is not a question of what was or was not medically appropriate. This is a question of civil rights--more specifically a class of people being denied their civil rights. Typical people rule and those with different bodies must conform to societal standards. This is a classic case of individualizing disability. The refrain is old, worn and sadly familiar. We are talking about one teenager with Autism. This is identical to we are talking about one girl named Ashley X in Washington. Sorry but no. We are talking about all people with autism, all people with a disability, all people who have an atypical body. We are talking about people who are a class apart and subject to medical treatments that would not be considered if they were “normal”. In my book that makes the atypical less--that is denied their personhood. This is wrong. Caplan should know better.